Kiln drying logs is a wood drying process that is much more rapid than the traditional seasoning process. When logs are cut from trees, they contain high levels of moisture, meaning it takes months, seasons or even years to dry them out. Conventionally, logs are stored in a shelter and naturally aired over time (known as seasoned logs). What are the benefits of kiln drying? Baking logs in a kiln can quickly reduce moisture. Cast iron kilns are capable of drying logs within a matter of hours. Hardwood species such as oak or ash tend to take longer to dry out due to their wood density, so using a kiln can ensure moisture is reduced to an acceptable level for burning. The general standard for kiln-dried logs is to contain less than 20% moisture. Because of this, they light easily and tend to burn hotter than logs with a higher moisture content. Kiln-dried logs are also commonly referred to as ‘ready to burn logs’. As well as getting hotter, kiln-dried logs also burn longer than regular seasoned logs when used in a wood-burning stove. This is because the kiln drying process leaves the logs so dry, your stove can be set to restrict the oxygen intake to the minimum setting, giving you a slower, longer burn from your logs. Is kiln-dried wood better than regular logs? Absolutely. Kiln-dried logs are a better, more reliable choice than seasoned logs. Whilst some seasoned logs can be good quality, their moisture levels can be inconsistent. The beauty of kiln-dried logs is that when logs are put into a kiln for a set time, at a specific temperature, it will ensure moisture levels are always below 20% – perfect for your wood-burning stove or open fire. With seasoned logs, the drying process is dependent on them being dried over a longer period of time. As the demand for logs goes up, it may be tempting for some suppliers to sell wood that isn’t quite ready for burning. What species are your logs? Our bags contain premium, kiln-dried hardwood logs that have been sustainably sourced from British woodland. For the purpose of sustainability we do not target specific wood species. Our bulk bags mostly contain ash, beech and oak which pack a punch when it comes to heat, so you’ll be getting more for your money. Softwood species such as pine can be too dry if their moisture levels are below 20%, and they will burn incredibly quickly. For obvious reasons, this sort of wood isn’t suitable for stoves and open fires because they will need constant attention and refuelling in order to maintain heat. Dried hardwood is the best choice for wood burners as it will burn slower due to having a higher density than softwood. What’s the best wood to burn? For starting a fire, kiln-dried softwood makes the best kindling because it catches fire easily and will create large flames that are needed to spread fire across logs or coal. To keep the fire going, kiln-dried hardwood is the best option to use as a continuous source of fuel once a fire has been established. 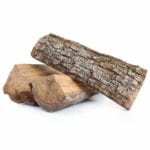 Hardwood species like ash, oak or beech are ideal for firewood logs. Any wood that is freshly cut from a living tree will be full of moisture. Whilst a tree is alive, litres of sap and water will move through its wood with moisture moving from the roots to its branches and leaves. Once the logs have been cut from the tree, they will gradually lose moisture and shrink naturally. Kiln drying speeds up this process. Generally, if the moisture levels have been taken to below 20%, the wood will not shrink much more than they would naturally. How are your logs processed? 1. Our hardwood is sustainably sourced from British woodland. 2. Hardwood trunks are loaded onto a truck and transported to a sawmill to be processed. 3. The logs are then cut and split using machinery that is powered by electricity, supplemented by solar power. 4. Once the logs have been cut, they are put into a red-hot kiln to reduce moisture content (making them even drier than regular seasoned logs). 5. After the logs have been baked in the kiln, they are tested by quality control to make sure they contain less than 20% moisture. 6. These incredibly dry logs are then sorted into different sizes and are bagged up ready to be delivered to any mainland UK address. For occasional use, you’ll most likely need either the 30-bag pallet or the 0.8m3 bulk bag. The bulk bag is equivalent to 24 small bags or nets of logs. For moderate use (2 to 3 fires per week), either the 50-bag pallet or the 1.2m3 bulk bag will most likely suit your needs. The bulk bag is equivalent to 36 small bags or nets of logs. For regular use (fires most nights per week), we recommend either the 70-bag pallet or 1.6m3 bulk bag. The bulk bag is equivalent to 48 small bags or nets of logs. Generally the more logs you buy, the lower the price per log. Why is a bulk log buying the best value? Whilst Homebase, B&Q and Aldi sell reasonable logs, buying in small quantities works out more expensive than buying in bulk. Buying small qualities of wrapped logs also creates an unnecessary level of waste, compared to buying in a large bulk bag. Is there an option to recycle the packaging? When you buy from us, we’ll give you the option to return the bulk bag, so it can be reused. We offer a money back guarantee and all queries will be responded to within 12 hours. If you have any questions, just send us an email and we’ll do everything we can to help. We strive to offer a 5 star service and you can see what our customers have to say on our independent review facility. Can you store kiln-dried logs outside? Yes, kiln-dried logs can be stored outside. We recommend storing under shelter, such as in a wood store, shed or a greenhouse. 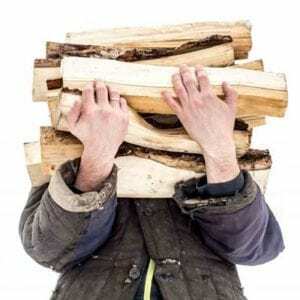 Even if your kiln-dried logs do get slightly damp, they will most likely remain relatively dry internally and will still be suitable for burning. If your logs are looking damp, we recommend bringing in a batch that you intend to burn the night before you need them. This will help eradicate any external moisture. Seasoned logs are more prone to re-absorbing moisture whereas kiln drying actually helps seal the logs and prevent moisture re-entering them.